Desert Trace, formally known as Sienna, features the collection of homes in Indio California built by Woodside Homes and Ryland Homes. This gated community is located in North Indio off Jackson Street. These homes are a collection of single and two-story homes from about 2400 ft.² to 3200 ft.². They come in sizes and layouts in three, four or five bedroom options. Most of the homes offer open kitchens, cozy fireplaces and luxurious master suites. Bedrooms offer spacious walk-in closet in the master bathroom has a soaking tub and separate shower in most homes. Kitchens feature center islands, large living spaces and separate formal dining rooms. Most homes also have a den, media niches, spacious laundry rooms and bonus rooms. Homes feature either a two or three car tandem or combat garage. You can access Desert Trace off of Gore Street or Jackson Street on either side just north of Avenue 42. Home prices are between $330,000 and $410,000. Homeowners dues are $90 per month and cover common area maintenance and community landscaping. Many homes also feature an inground swimming pool and/or spa. The community features a walking path through the neighborhood and a gated entry. This community is located next Interstate 10 and is about 10 minutes to La Quinta and Palm Desert. There are restaurants, shopping, golf, fitness, and entertainment all within a mile or two from this community. 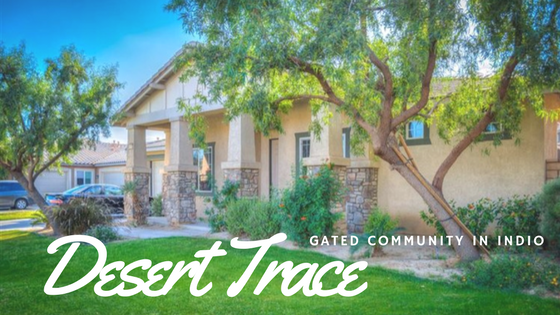 For more information on Desert Trace please see available listings on our website for free or contact my office to schedule a showing at any time.